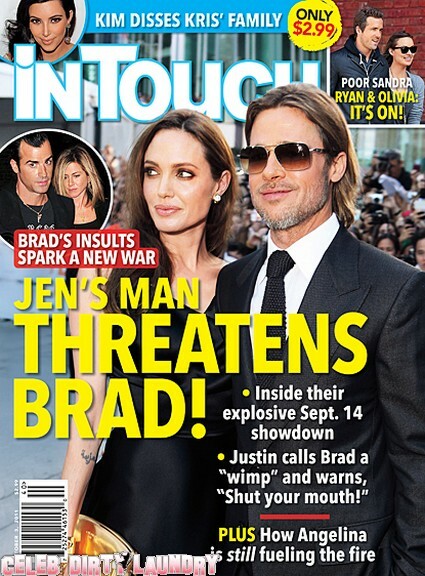 The October 3rd, 2011 issue of In Touch cover story is ‘Jennifer Aniston’s Man Threatens Brad Pitt’. You don’t have to be a fortune teller to realize that Brad must be regretting his comments to Parade Magazine. This is the forth magazine today that has the Brad Pitt/Jennifer Aniston story on their cover. At least In Touch has a different slant on it. They have Jennifer’s new boyfriend threatening Brad Pitt and telling him to shut his mouth. They also claim Angelina is fueling the fire. Enough already with these rumors. I am so worn out with the Brad Pitt/Jennifer Aniston thing. It’s getting out of hand, really. Brad says that he was misinterpreted in his comments and it seems like the entire tabloid world is having a field day. Perhaps he should have just kept his mouth shut and not have given such a personal glimpse. He doesn’t let the rumors bother him, so there’s that. Is this just getting to be too much? Are you sick of the rumor mill surrounding these couples? Let us know your thoughts in the comments!